An estimated sixty-five percent of Americans have bad breath. Over forty-million Americans have "chronic halitosis," which is persistent bad breath. Ninety percent of all halitosis is of oral, not systemic, origin. Americans spend more than $1 billion a year on over the counter halitosis products, many of which are ineffective because they only mask the problem. Bad breath is caused by a variety of factors. In most cases, it is caused by food remaining in the mouth - on the teeth, tongue, gums, and other structures, collecting bacteria. Dead and dying bacterial cells release a sulfur compound that gives your breath an unpleasant odor. Certain foods, such as garlic and onions, contribute to breath odor. Once the food is absorbed into the bloodstream, it is transferred to the lungs, where it is exhaled. Brushing, flossing and mouthwash only mask the odor. Dieters sometimes develop unpleasant breath from fasting. Periodontal (gum) disease often causes persistent bad breath or a bad taste in the mouth, and persistent bad breath may mean a sign that you have gum disease. Gum disease is caused by plaque - the sticky, often colorless, film of bacteria that constantly forms on teeth. Dry mouth or xerostomia may also cause bad breath due to decreased salivary flow. Saliva cleans your mouth and removes particles that may cause odor. Tobacco products cause bad breath, stain teeth, reduce your ability to taste foods and irritate your gum tissues. Bad breath may also be a sign that you have a serious health problem, such as a respiratory tract infection, chronic sinusitis, postnasal drip, chronic bronchitis, diabetes, gastrointestinal disturbance, liver or kidney ailment. Bad breath may also be caused by medications you are taking, including central nervous system agents, anti-Parkinson drugs, antihistamines/decongestants, anti-psychotics, anti-cholinergics, narcotics, anti-hypertensives, and anti-depressants. Daily brushing and flossing, and regular professional cleanings, will normally take care of unpleasant breath. And don't forget your often overlooked tongue as a culprit for bad breath. Bacterial plaque and food debris also can accumulate on the back of the tongue. The tongue's surface is extremely rough and bacteria can accumulate easily in the cracks and crevices. Controlling periodontal disease and maintaining good oral health helps to reduce bad breath. If you have constant bad breath, make a list of the foods you eat and any medications you take. Some medications may contribute to bad breath. Improperly cleaned dentures can also harbor odor-causing bacteria and food particles. 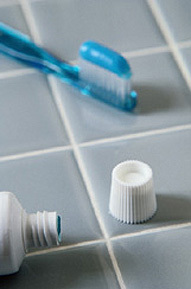 If you wear removable dentures, take them out at night and clean them thoroughly before replacing them. If your dentist determines that your mouth is healthy and that the odor is not oral in nature, you may be referred to your family physician or to a specialist to determine the cause of the odor and possible treatment. If the odor is due to gum disease, your dentist can either treat the disease or refer you to a periodontist, a specialist in treating gum tissues. Gum disease can cause gum tissues to pull away from the teeth and form pockets. When these pockets are deep, only a professional periodontal cleaning can remove the bacteria and plaque that accumulate. Mouthwashes are generally ineffective on bad breath. If your bad breath persists even after good oral hygiene, there are special products your dentist may prescribe, including Zytex, which is a combination of zinc chloride, thymol and eucalyptus oil that neutralizes the sulfur compounds and kills the bacteria that causes them. In addition, a special antimicrobial mouth rinse may be prescribed. An example is chlorhexidine, but be careful not to use it for more than a few months as it can stain your teeth. Some antiseptic mouth rinses have been accepted by the American Dental Association for their breath freshening properties and therapeutic benefits in reducing plaque and gingivitis. Instead of simply masking breath odor, these products have been demonstrated to kill the germs that cause bad breath. Ask your dentist about trying some of these products.